I grew up eating this cake, and loving it. It is delicious and EASY. You don't even need a mixer! You just stir it up by hand with a trusty wooden spoon or rubber scraper. Combine the cake mix and pie filling in a mixing bowl. In a separate small bowl, whisk together the eggs and almond extract. (This is my added step. If you like, you can just throw them in the mixing bowl. I find that I can incorporate the eggs better if they are beaten a bit first.) Add the egg mixture to the cake and pie filling. Stir well to incorporate all the ingredients. 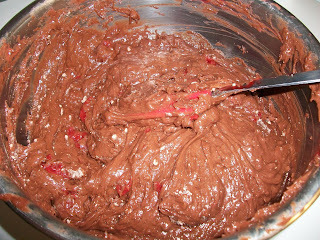 Make sure to scrape the bottom of the bowl a few times, and "turn" the batter well to moisten all the cake mix. Pour into a greased 9x13 pan, and bake! Could it get any simpler? For the frosting, combine sugar, milk and butter in a small saucepan. Remove from the heat and stir in the chocolate chips. Stir until all the chips have melted and the icing thickens a bit. Pour the frosting over the cake while the cake is still warm (within about 45 minutes of removing it from the oven). 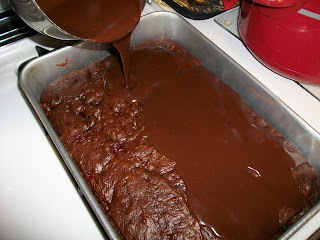 You should be able to mostly cover the cake by just pouring, but you may have to spread it a little with a spatula. You can store the cake for a few days at room temperature, covered. This cake is best served with vanilla ice cream. Or eaten right out of the pan. For more great recipes, head over to Family Recipe Friday, Foodie Friday, Food on Fridays, and Friday Feasts. 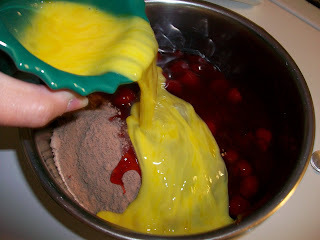 Combine the cake mix and pie filling in a mixing bowl. In a separate small bowl, beat the eggs and extract. 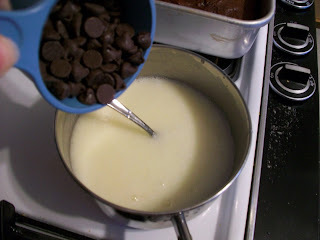 Pour the eggs into the cake mix bowl, and stir well to incorporate all ingredients. 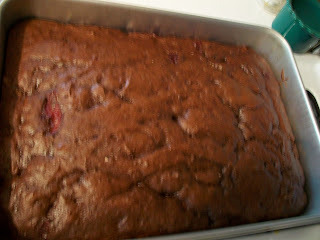 Pour into a greased 9x13 pan and bake at 350 for 25-30 minutes, until the cake tests done with a toothpick. 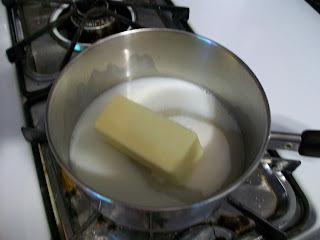 For the icing, combine the sugar, milk and butter in a small saucepan. Bring to a boil over medium heat, stirring constantly. Boil and stir one minute. Remove from heat and stir in chocolate chips. 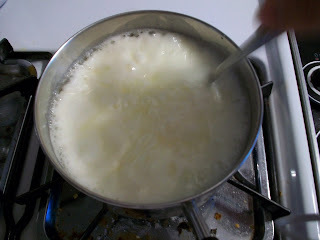 Stir until smooth and slightly thickened. Pour over the cake while the cake is still warm. Store covered at room temperature. Serves 16-20. Wow this looks delicious, I love the icing, and also I bet the cherries in the cake are wonderful. How good does this look!! !Please save a piece for me. I can see why it's your husband's favorite. Have a wonderful day. You are my new bestest friend. I love chocolate and Cherries. I will make this recipe. I just left Mary @ One Perfect Bite, where I left a comment that my two biggest weaknesses are donuts and a good chocolate cake. Mary posted homemade cake donuts and now I find a chocolate cake here — my diet is doomed! Yum and easy are my favorite two words:) Thanks for sharing this as I often look for easy recipes in the summer. We're thinking alike! Last week for my daughter's birthday, I made a Vodka cake (don't panic, she's 36) but I didn't have any Vodka. 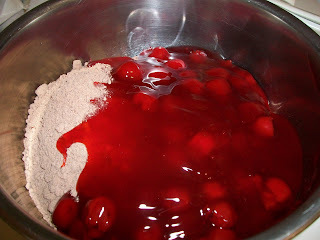 I found some cherry liqueur to substitute and I almost added the cherry pie filling. Now I wish I had! Your recipe sounds wonderful! I love the combination of cherry, almond, and chocolate. Elena Blthe, this has become one of my stand-by recipes. Everyone always loves it... and they always think I fussed way more than I did. Oh yum!! What a good looking cake. I love using a cake mix recipe especially one that sounds so good. I am going to have to give this a try. I will definately make this to take to our RV when we go camping. My whole family will be there. I'm sure everyone will love it. Oh, thank you, thank you for this DIVINE cake. It's a winner! I love the layers and layers of chocolate and the infusion of cherries! I'm starving! lol Have a great weekend. That looks so good! I will definately be adding it to my list! Thanks for sharing! 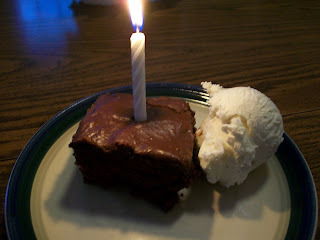 I made this for my hubby's birthday, too! I added a 1/2 cup of coca cola! Thanks, Elena Blthe! Very yummy!! Can the almond extract be replace by vanilla extract? This cake looks awesome and I'm excited to try it for my boyfriend's family, but his sister is allergic to nuts. Froggygurl, yes you could use vanilla extract. Let me know how it turns out! brought tears to my eyes! My favorite cake growing up.... Just like Mom use to make !! !